Malaysia Airlines has confirmed it has lost contact with one of its flights between Kuala Lumpur and Beijing. 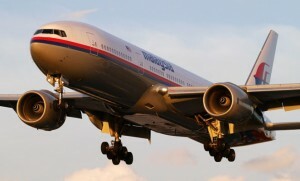 The aircraft, a Boeing 777-200ER reportedly registered 9M-MRO delivered to the airline in May 2002 and powered by Rolls-Royce Trent 800 engines, was operating flight MH370 which departed KL at 12.41am local time and was due in to Beijing at 06.30 local time (09.30AEDT) this morning. The aircraft had reportedly accumulated 20,243 hours and 3,023 cycles in service. The airline says the flight was carrying 227 passengers and 12 crew members, and that contact was lost with the aircraft at 02.40am KL time. The Flightaware tracking program lost contact with the flight about 20 minutes after takeoff as it was crossing the Malay peninsula at 35,000ft. 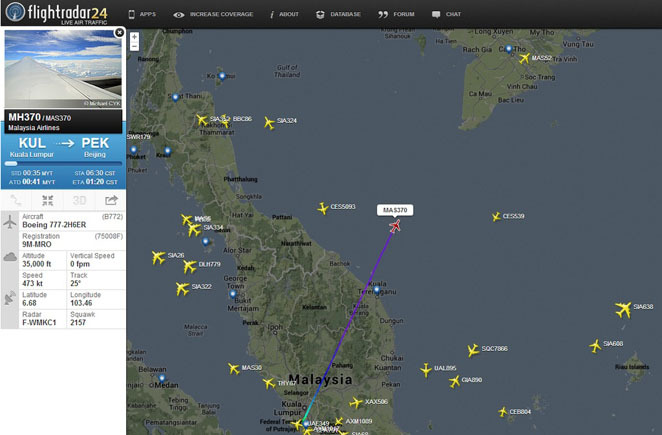 The Flightradar24 program was able to track it into the South China Sea towards Vietnam before losing contact. In a statement released by the airline, CEO Ahmad Jauhari Yahya said; “We deeply regret that we have lost all contacts with flight MH370 which departed Kuala Lumpur at 12.41 am earlier this morning bound for Beijing. The aircraft was scheduled to land at Beijing International Airport at 6.30am local Beijing time. 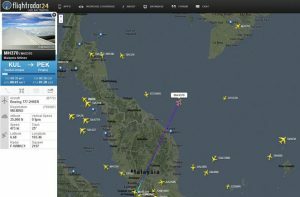 Subang Air Traffic Control reported that it lost contact at 2.40am (local Malaysia time) today. Chinese state media reports that the aircraft never made contact with Chinese ATC nor entered its airspace. UPDATE: Malaysia Airlines held a media conference at 14.00AEDT. In it, an airline official said the flight had been a codeshare flight with China Southern Airlines (CZ748), and that the Captain of the flight is a 53 year old Malaysian national who has 18,365 hours of flying experience and joined the airline in 1981. The First Officer is a 27 year old with 2,763 hours experience and joined the airline in 2007. The airline gave a breakdown of the nationalities of those on board. These include seven Australian and two New Zealanders, as well as 153 Chinese, 38 Malays, 12 Indonesians, three French, three US citizens, two Ukrainians, and two Canadians. Those who may have relatives travelling on the flight are asked to call the airline on +603 7884 1234. UPDATE: An official of the Civil Aviation Authority of Vietnam (CAAV) reportedly told Reuters that the flight had failed to check in as scheduled at 17.21 GMT while it was flying over the South China Sea between Malaysia and Vietnam. “Its code didn’t appear in our system,” Bui Van Vo, the CAAV’s flight control department manager, told Reuters. NOTE: This is an evolving story and we will be updating it throughout the day as information comes to hand. Thoughts and Prayers go out there for a happy outcome!!!!! Agree Justin, but I fear the worst. It would be good if the media would stop speculating on what’s happened (not aimed at AA) . Why do they feel the need to make up false stories when families affected by this event are themselves trying to find out where their loved ones are? Reports in media say that it has been confirmed crashed into the ocean 🙁 truly a very sad day in aviation…. Again my thoughts and prayers go to all those family and friends of the passengers and crew. Justin – let’s wait until we something official from MAS or from the Malaysian or Vietnamese governments. So far all we know is an oil slick has been found near where the aircraft was last seen on radar. Some of the false reports such as the aircraft landing in China or wreckage being found have come from unverified social media sources which are in turn ‘picked up’ by some mainstream media outlets. All the information posted here on AA has come from MAS or Malaysian government official releases only. Two 777-200ER accidents in one year. First Asiana 214 in July ’13 and now this incident. The 777 has an outstanding safety record. Perhaps, like Asiana 214, pilot error is to be blamed? Certainly not good for MAS with their stock prices plummeting since January, this will be a long recovery. Major failure here for nothing to show up already.35.000 feet. Very sad . The heart wants everything to be ok. The head knows that it won’t be. Whatever happened was obviously catastrophic and probably pretty instant given the fact a vastly experienced crew didn’t make a radio call and that the “descent” appears to have been virtually straight down. The reasons are all speculative of course from an innocent stall to all manner of other scenarios. Whatever the case, it is simply awful and as Justin says prayers for all involved is about as much as we can offer. Do we know if the aircraft was on R208 and did it make compulsory reporting point “igari” and turn right onto R765? This is really a great tragedy and I sympathize with the relatives and friends of the people on board this aircraft. What I find totally unacceptable in circumstances such as these is the variance of supposed facts that the media of all persuasions heap on the gullible public. They should be held accountable for all the “real” events they get wrong. Even the numbers don’t stack up. Seven Australians,Six Australians,flip a coin guys and see what turns up.Not only in this event but I seem to find discrepancies all the time on different TV channels and much to my surprise varying accounts of the same happening on one radio station. If you can’t get it right get out of the business. Just wondering if this Boeing 777 ever had a tail scrape.maybe rear pressure bulkhead failed,heard of a similar accident with a 747 years ago,but maybe that wingtip accident the aircraft sustained wasn’t repaired properly. Regarding the RMAF Radar data, if this is correct. How did they id the acft as MH370 when there was no SSR Code being transmitted? If the acft was over the Malacca Straits has this information being cross checked with Indonesian Primary and SSR systems? The 777 that disappeared on Saturday was involved in a serious accident at Shanghai’s Pudong International Airport in August 2012. In that incident the 777’s wing struck the tail of a China Eastern A340 with such force that it sheared off the wing tip and it was left embedded in the A340’s tail. While a new wingtip was installed investigators are looking at the damage reports to see what other damage occurred. It is also possibly they say that some more serious damage went undetected. The worst single aircraft crash was the result of a faulty repair down to the rear pressure bulkhead of a Japan Airlines 747 in 1978. This is from the Cessna Pilots Association (USA) Forum that I belong to. If this is correct, I hope it is being used. There is another way that flights are tracked far removed from what we know as ATC Radar (or Flight Aware) etc. Think of it this way….you know that nearly every piece of space junk is tracked by government equipment. Every flight in the world is also tracked by our government. Not much is said of this system as it is beyond secret in how it is done. Think NORAD and what has been made public about their ability to track all flights etc. Learned about this when making position reports across the Atlantic. One day…a fellow I trust, told me that if absolutely necessary and with approvals, our government could tell ATC our exact location at any moment. The agency that does this does not normally interface with ATC though they certainly could if they wished (to further identify an aircraft for instance). I bring this up only because of the comments about changing the search area for the missing 777. Just as our government knows what travels underwater all over the world….it also knows what is traveling through space…and where every flight in the world is and where it is heading. Necessary for our defense. I am guessing a call was made from a “black” government agency to someone involved in the search for the 777, redirecting them to a better search area. Denials would follow any inquiries down that path.